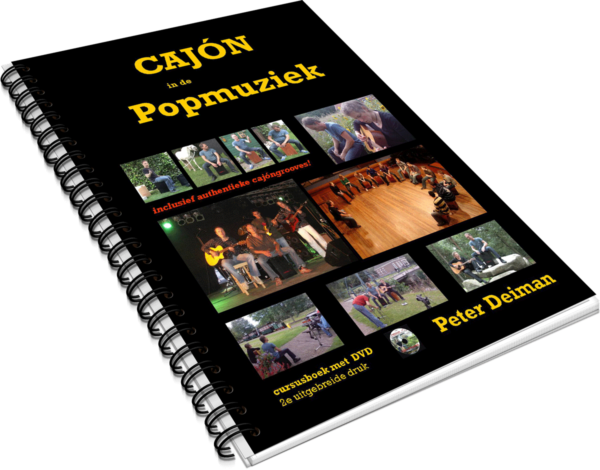 The book + DVD Cajón in Rockmusic may be called a number with more than 1000 copies, better still: more than 1000 satisfied users. The cajón course is for both the novice and the more experienced percussionist. For someone who is already involved with percussion in one way or another, there will be a lot of recognisability. Nevertheless, the book also provides sufficient stimulus for him because of the wealth of information and challenging metronome figures. In the book you will find clear and instructive instructions to get started yourself. The course consists of seven chapters. Each chapter is divided into topics. During the course, several references are made to topics that were discussed earlier. You develop new techniques and grooves step by step. Examples of songs can be found in abundance. The grooves are simply displayed with a newly designed notation system and invite you to play from the first page. No awkward notation so you have to struggle through: the accented beat is represented by a bomb, the light stroke by a fingertip. When you leaf through the book you immediately understand what is meant. After the course you will know which groove can best be played with many music styles. The book includes a DVD with recordings made mainly in the open air plus beautifully designed studio images. The examples of songs and exercises from this book are mostly played at three tempos: at half speed, three quarters of the speed and the original speed. The book will be sent within 2 to 5 days.